Launching a new website is stressful enough – so many things to check and tick off your list before you hit that publish button. But before you send it out into the world, have you stopped to think about what you might need to do for SEO? Creating a beautiful website is great, but without good SEO how will anyone find it? Even if you aren’t an SEO expert (let’s face it, most business owners are either terrified of it or can’t be bothered with it! ), there are some simple things you can do to help your website have the best chance of ranking after it launches. 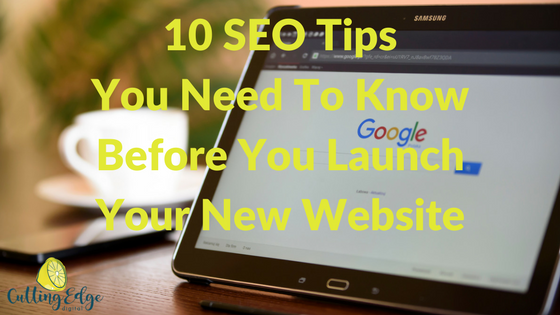 Here are my top 10 SEO tips that you need to know before you launch your new website. If you have a website, you need to track how many people are coming to your site, what pages they are looking at, and how long they are spending on it. These are the minimum metrics you should be tracking – installing Google Analytics on your website is a super easy process and allows you to access a minefield of data about visitors to your website and how engaged they are with it. I recommend Google Analytics By Monster Insights if you’re using WordPress. If you have any contact forms or downloads on your website, set these up as goals in Google Analytics. This will give you a tangible way to measure how many people are taking the action you want on your website. Every website should set up Google Search Console. This is an extremely valuable tool which allows you to communicate with Google about your website and also gives Google a way to communicate with you regarding any issues with your website. Find out more about what Google Search Console is all about on my blog now. Once you’ve set up Search Console, add your sitemap to Search Console. Your sitemap tells search engines what your website structure is and what pages you have on your website. Usually the URL is /sitemap_index.ml or /sitemap.xml and this can be easily set up on a WordPress website using the Yoast SEO plugin. A robots txt file tells search engine spiders what pages they are allowed to crawl and show in the search results and which pages you don’t want them access. Some pages you may choose not to index are your shopping cart or login pages. Often when web designers are building new websites, they add a robots txt file to block search engines from finding it until it’s ready. But they often forget to update it once the site launches so you end up with a site that is unable to rank at all! So make sure your robots txt file doesn’t say ‘Disallow: /” – this means the search engines can’t crawl any pages on your website. It’s 2017 people. That means that everything is all about mobile. Most websites get the majority of their traffic from mobile devices these days so making sure your website looks good and is easy to navigate on a mobile or tablet is crucial. our content is crucial to your probability of ranking. When you write content for your website, make sure that your home page has at least some text on it and subpages need to have a decent amount of quality content on them. Don’t write just for the sake of getting your keywords on the page, Google can see straight through that. Write for your audience, make it useful for your audience but don’t forget that Google will be reading it too. Title tags and meta descriptions are crucial SEO elements on any website. Use a plugin like Yoast SEO and create title tags and meta descriptions for each page on your website. Use phrases that you want people to use to find your website when they search online. For example if you’re writing about the new Perth to London direct flight, don’t use a generic title like ‘Flying High’. Go for something more searchable like ‘Direct Flights From Perth To London Now A Reality’. 9. Do You Need To Redirect? If you’ve already got a website and you’re rebranding or building a new site on a new domain, you want to make sure that you redirect any old URLs that won’t exist anymore to the most relevant new one on the new website. If you are using a new domain, redirect the whole domain to the new domain. Don’t forget that you can optimise your images, not just your text. Add alt attributes to your images – just make sure they aren’t too spammy and are actually relevant to the image. Creating a custom 404 page is a good way to make sure that even If people find a broken link on your website, they can stay on your website and find what they are looking for elsewhere. So there you have it, my top 10 SEO tips that you need to know before you launch your new website. Hopefully you’ll find this list useful when it comes to launching your website! If there are any topics you’d like me to write about, let me know in the comments! And if you’d rather someone took care of your SEO set up for you, get in touch with me today. I’m passionate about quality SEO at affordable prices and I’d love to help you.